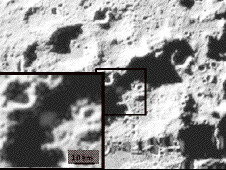 Location of the LCROSS impact debris cloud, Cabeus Crater. Credit: NASA. If the Google homepage is anything to go by, excitement about space exploration was further reinvigourated by the discovery and measurement of water on the moon. The implications for a lunar base are profound, and hence for any new ’Apollo Project’ that gets us there. On October 9, 2009, a probe was hurled into a permanently shaded portion of Cabeus crater in the moon’s south pole. Ejected debris was analysed by a trailing satellite, looking for fingerprints of water, and they were found. Enough to indicate at least 25 gallons. We had many clues about water on the moon before the latest experiment. Released in September of this year was the most detailed map to date, based on evidence from NASA’s Moon Mineral Mapper (M3), of lunar water in the poles. With a spectrometer, scientists ascertained the composition of the lunar soil by examining the light reflected off the surface. Different molecules have different absorption spectra. That is, in terms of light, some wavelengths are preferentially absorbed and others reflected. A leaf looks green because chlorophyll preferentially absorbs the other wavelengths of visible light, leaving the green to be reflected and reach our eyes. Water, and an associated compound hydroxyl (-OH), have their own spectral fingerprints. As shown by the M3 study, these fringerprints were all over the Moon’s poles like a clumsy burglar. 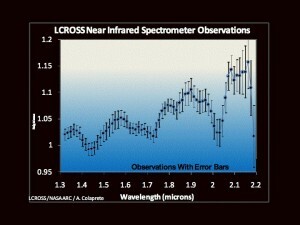 Emission spectrum of the LCROSS debris cloud 20-60 seconds after impact. Credit: NASA. Fast forward to today’s news, the same detective work is at play. A probe was propelled into a shaded portion of a polar crater, and the spectral fingerprints of the ejected debris were measured by the Lunar CRater Observation and Sensing Satellite (LCROSS). Hydroxyl was found again. This time, though, an estimate of the amount of water could be made: 95 litres (25 gallons) from the observed debris, more unseen. A permanently shaded target was selected as being the most likely repository for substantial quantities of frozen water. Even on the Moon, water can evaporate — or sublimate — but shaded crater slopes act as a cold trap, seconding water like the inside of your car window when it’s cold outside. The finding feeds our curiosity about nature, but we are not sated. It sows a seed for yet more questions and more discoveries. As Albert Einstein said, ’Imagination is more important than knowledge.’ Imagination comes first. The discovery of water on the moon may be just the ingredient to spark our collective imagination to once more push ourselves to new heights of knowledge. Todays integrated circuits and fuel cells are technological off-springs directly stemming from the Apollo Project. GPS, virtual reality and many other advances (but not velcro) grew out of our desire to explore space. Neil Armstrong’s footsteps froze a planet in awe, staring at TV screens or glued to the radio. Getting to that point, and what came after, has shaped cultural evolution as if we were a potter’s clay. Space exploration has paid off well more than we, as humanity, invested. It does come with its costs, certainly, but as the authors of Freakonomics reported back in Janurary 2008, the benefits are profound. The newly found lunar water would be invaluable in sustaining any human presence on the moon. It may become an ingredient in rocket fuel. Just as it is on Terra Firma, water is our most important natural resource. Many argue that a moon base is not what we should aim for, Buzz Aldrin included — that we should sets are sights on Mars. Could be, could be. But whatever sight is chosen, science will likely come through with the goods. Sights are not chosen for their scientific benefit or efficiency, however, but for national pride. What propelled us to the moon was just as much collective imagination and ingenuity as American pride during the Cold War. India and China are now in the game. Do they lack more terrestrial needs? No. Nor does the US. But they look to the skies all the same, and dream.